I think of avatars as vehicles, a means of travel within virtual worlds. They are frozen fragments of our kaleidoscopic self-image(s). Avatars as vehicles cost a lot less than a car and are capable of taking us to outer space one minute and far beneath the ocean in the next. Mosaic pieces of self spinning through the electric hum of cyberspace. A log rolling self portrait ? Lady Fog avatar on the island of Cocoon. Visitors to different virtual world locations often adapt their avatars to blend in and belong. (Avatars tend to be rather conformist, but don’t tell them that.) 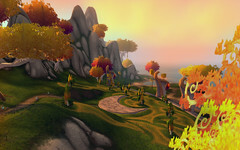 Creators of both whimsical and educational locations in virtual 3D worlds encourage tourists to kit out their avatars according to the relevant theme. By encouraging visitors to ‘dress’ appropriately they can become more fully immersed in the experience of their visit. For example, if you visit the *1920s Berlin Project in Second Life it is suggested that you wear the (free) 1920s clothing provided. This helps avoid the faux pas of wandering around pre-war Berlin dressed as a medieval knight or a Nasa astronaut (basic considerations for experienced time travelers). To my mind, this shows how we wear the places we visit in online 3D worlds (just as in our physical apparently–more–real–world). With this in mind, I have recently been entertained by the idea of donning a Second Life avatar and then giving myself the task of seeing what place the avatar might wear… Hence the post where Lady Fog is liberated from a framed picture in the Meta_Body exhibition and carried away by mechanical flying boat to the island of Cocoon. Avatars are playing an ever greater role in our online lives. You do not have to visit virtual worlds to have one. Facebook, Twitter, Flickr and a multitude of other social networking sites use avatars nowadays. In fact, at Gravatar.com you are encouraged to zip up your ‘Globally Recognized Avatar‘ and prepare it for travel across the internet where it can be used on (as they say) a ‘kajillion websites’. These gravatars are colorful cubes that we can stick in the comments box on sites (strangely parallel to sending letters with a postage stamp on an envelope). WordPress provides free patterned squares of color to those who lack a gravatar thus enabling them to leave a little decorative stamp of individuality in the comments area below posts. (Try it and see, you will be given a colorful cube with a geometric design (that looks surprisingly like a quilting pattern) should you decide to leave a comment below this post… Theoretically, once you have experienced a Gravar first hand you will be so stirred with the hunger to establish your own virtual identity you too will set out to establish your very own cube of portable social presence. In a way, a gravatar is our digital portrait. The poor person’s land grab in the digital void. The rich and famous commission paintings of themselves; these are highly controlled portrayals designed for posterity, destined to be the lasting record of their lives, forever posed in a good light. Well, whether you use the term avatar or gravatar, these pictorial signatures are cost cutting self-portraits and part of their economical use derives from the fact that they acquire significance from their surroundings. That is, you are saying something about yourself not only from how you depict yourself in your image cube but also in where you place your avatar/gravatar. The location soaks into your little avatar stamp and flavors it with peripheral information about your tastes and sensitivities. 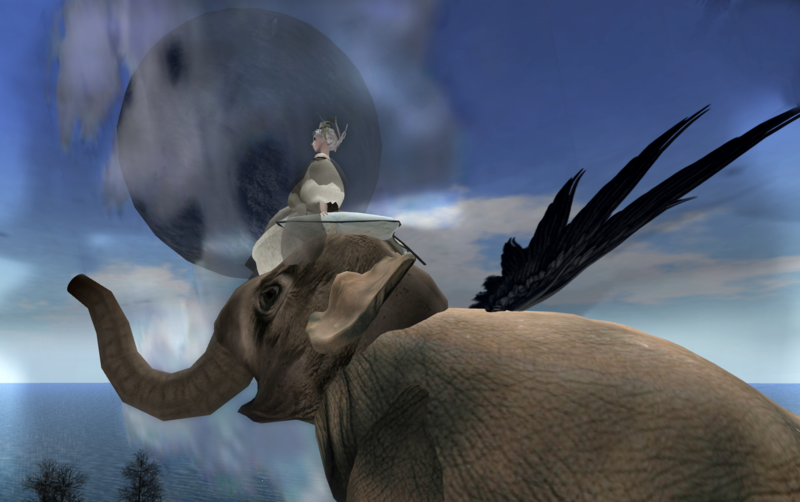 Cyberloom dressed as in Meta_Body's 'Fog' avatar seated upon a flying elephant. This seems a good place to finish this post with an important statement about myself. I leave you with a picture of Cyberloom wearing borrowed avatar clothing, traveling through digital space seated upon a comfy cushion on a flying elephant. It really does say a lot about me. *1920s Berlin Project in Second Life is actually a role playing sim in Second Life. This means site-seers are welcome but it is important that they wear the clothing of that period and allow those who are actually role-playing (i.e. imagining themselves in Berlin at this time and exploring their stories) are not interrupted. See the interesting article about this sim written by Jo Yardley, make sure that you check out the comments section as there is additional information posted there as well. The Petrified Gallery: Meta_Body Exhibit created by Meilo Minotaur and CapCat Ragu. Slurl: http://maps.secondlife.com/secondlife/Porto/126/113/703 (Please visit the gallery to see more of the avatar creations of Meilo Minotaur and CapCat Ragu. Photography by Cyberloom is licensed under a Creative Commons Attribution-Noncommercial-Share Alike 3.0 United States License.